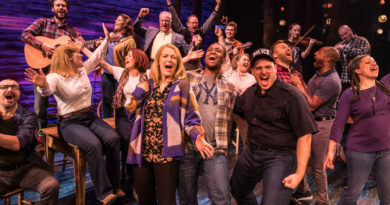 The audience reaction is one of delightful fear mixed with momentary laughter at a horror romance for the stage suitable to entertain all this Christmas. 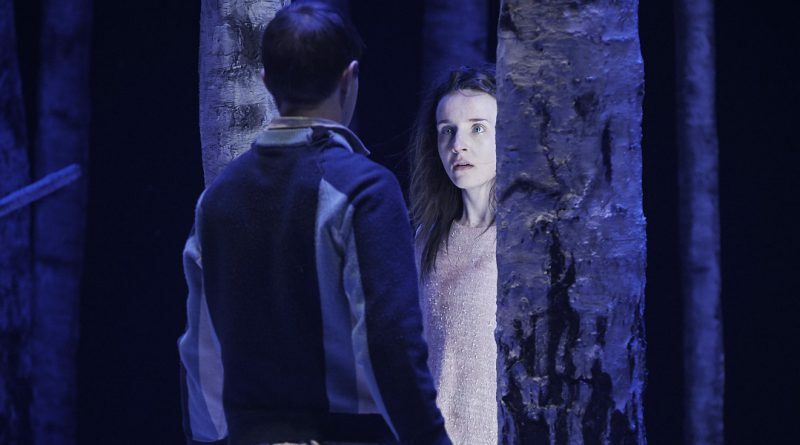 Let the Right One In at the Abbey Theatre is the perfect time out for anyone who needs to escape festive music and faux glee for just a couple of hours this holiday season. The 2004 cult book by Swedish John Ajvide Lindqvist was later adapted into a Swedish film in 2008 and was instantly adored by horror aficionados. It hit even wider global audiences when the script was again transformed into a U.S movie, starring Chloe Moretz in 2010. But the Abbey play, directed by the highly respected John Tiffany, is a different beast altogether and fans of the movies should not expect the same horror treatment here. The film versions are certainly more chilling than the stage creation but where horror is lacking, heartwarming drama and skillful choreography offer willing replacements and to the pleasure of the audience. Laughter ignites at awkward teenage moments throughout the play when the lovelorn Oskar (Craig Connolly) tries to connect romantically with his mysterious, young neighbour, Eli (Katie Honan). And where thankfully there is no CGI to mold an innocent young girl into a terrifying monster, remarkable movement, gory special effects, eerie lighting and booming sound, create the devil within. The way Honan moves around the stage when in vampire mode, stalking, writhing, leaping and vaulting up trees and a climbing frame, is truly impressive and harks back to the horror classic, 1921’s Nosferatu. She is truly bone chilling without ever being recreated by visuals. Olivier award winning movement director, Steven Hoggett has help recreate a tantilisingly realistic vision of horror while the audience mull over just how such evil could exist within a child, a girl, besotted with a boy, a human boy. With the film, one is led to believe that perhaps Eli is truly evil beyond retribution and that she entraps her young suitor to tend to her needs throughout his mortal life, just as her elderly muse, Hakan (Nick Dunning) had done until his tragic demise. But with the play, we are let into a secret that perhaps Lindqvist had always meant to be buried within the plot – what if Eli didn’t wish to live forever, watching those she loves die. What if she wanted to be in love and to be safe and the fact she has to murder or watch as her lover kills for her, is only an aside. For the first time, Jack Thorne – the playwright who adapted the film for stage – and Tony award winning Tiffany have brought out the humanity of Eli and suitably so, as the Abbey audience was filled with young teenagers. Let the Right One has just the right dash of blood, guts, romance and drama, for a family audience and children seeking to be let into a secret they really shouldn’t know. Tiffany and Thorne were both on the team behind Harry Potter and the Cursed Child, a West End play which has proven to be record breaking after winning nine Olivier awards. 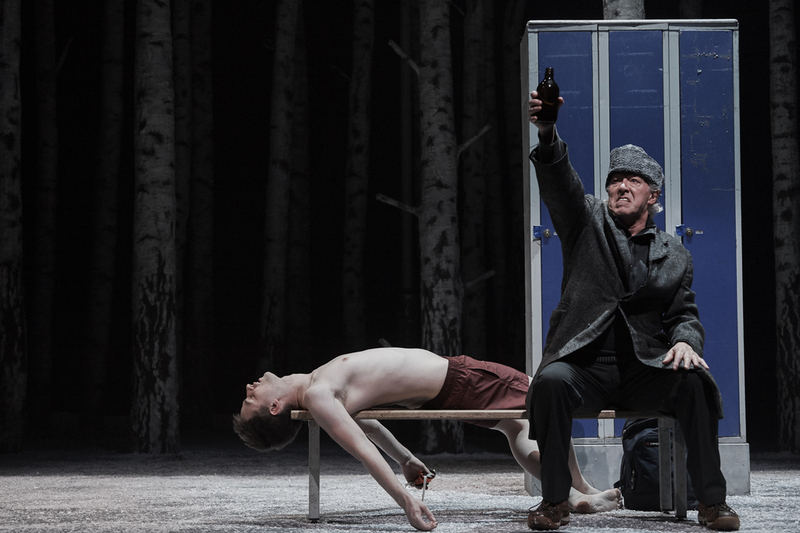 They are clearly a tour de force of stage and with this Irish cast they’ve re-created a very different version to the original horror story which will perhaps leave the blood a little less cold. Though for horror fans, it is unlikely the stage adaption will win a place in their hearts above the original. 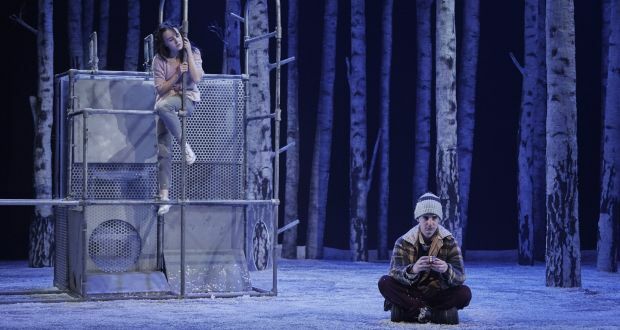 The superb set design, created by Christine Jones, another of the Cursed Child team, brings the audience through a Narnia like winter forest, to a child’s playground and the all important climbing frame where the two children meet and which morphs into a swimming pool which Oskar’s bullies will try to drown him in. The stand out actor without a doubt was Abbey regular, Nick Dunning. And despite youth playing a central role in this film, Dunning as Hakan reawakened the child from within when he spoke to his young muse, Eli (Honan). The most moving scene of the entire play comes when Hakan is sitting up in a hospital bed, disfigured after committing to damage his face so he’d not be recognised and help the police identify him and in turn Eli. Dunning proves himself a masterful actor in this scene as he manages to profess his undying love for Eli in a believable and heartbreaking manner. And so easily, this could have seemed perverse. After all she is a child and he is a much older man, with grey hair. Every utterance seems real and Dunning helps us visualise him as a young boy still in love with a young girl, who would take his entire life and the tragedy ensues that by his end, he’s already dead in her heart and her world revolves round Oskar. Let The Right One In is showing at the Abbey until January 20. ← Don’t underestimate the power of creative arts in troubled times.